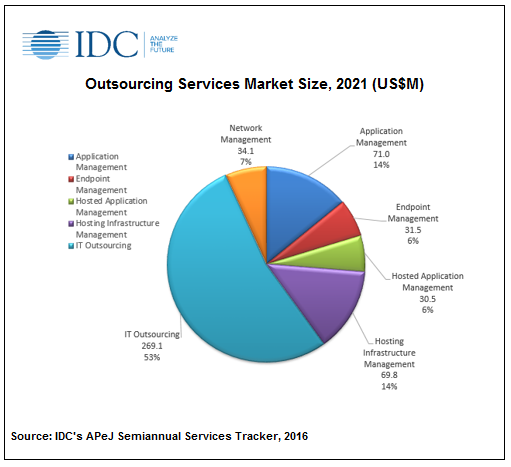 MANILA, August 21st, 2017 — The total outsourcing services spending in the Philippines is expected to exceed US$500 million by 2021, according to the latest forecast from the IDC APeJ Semiannual Services Tracker. Enterprises' Digital Transformation (DX) initiatives, as well as changing patterns of IT procurement and rapidly evolving service delivery models, will drive the Philippines outsourcing market to continue growing. "The Philippines outsourcing market is undergoing a dramatic transformation propelled by the increasing adoption of disruptive technologies. CIOs and technology leaders tap external capabilities to support their DX initiatives, meet ever-changing customer demands, implement solutions faster, and reduce cost," said Alon Anthony Rejano, Market Analyst for Services, IDC Philippines." In the age of greater automation, standardization, and modernization, external providers need to keep up and redefine their value proposition, offering new delivery and consumption models," he added. However, multiyear and multimillion-peso outsourcing deals are decreasing as end users look at cost cutting and show inclination toward cloud. This, in turn, is adding price pressure on providers, which drives vendor consolidation. IDC recommends that end users must understand where each outsourcing deal fits on the sourcing spectrum so that appropriate governance mechanisms can be created and managed. "The outsourcing market will remain a tough market for competition in the coming years. Local customers want to see vision and a strong offering, and while they want a partner for the long term, they are also willing to consider new partners that offer innovation," Rejano added. "Providers need to demonstrate thought leadership throughout the lifetime of the contract and provide high-quality service to help transform customers with DX agenda."